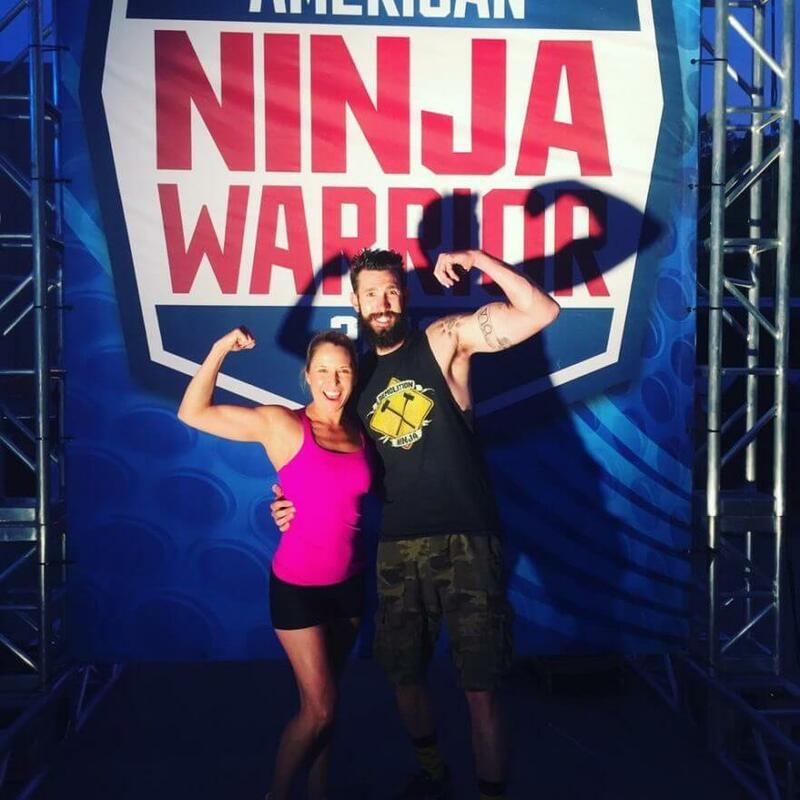 I decided last year to tryout for season 7 of American Ninja Warrior because I needed a new challenge. I have retired as an IFBB Pro Figure and Bikini competitor and also as a Pro WBFF Fitness Model Diva. I loved competing in bodybuilding, but after 10 years I was ready to hang up the suit. I submitted my video and application in January of 2015, but was not selected to tryout. Being an athlete, I knew it was probably a blessing in disguise because it gave me a whole year to train for the course. Fast forward another year and it was time to submit for season 8. WOW!!!! What a difference my upper body strength was and how much I have grown as an athlete and competitor. I knew I was ready to challenge that course. I shot my submission video at the facility I train at rather than the typical weight training gym I work at. I was able to show myself conquering the salmon ladder, hitting several laches at 6 feet apart and running up the warped wall with just half a foot to go to the top. Wthen I started I was only hitting the 10 foot mark, now I am consistent at 13 feet. I am sooooo close!!!!! I was really excited at the progress I had made over a year and I was very hopeful that I would get an opportunity to run the course. Once again, I was not selected to tryout for season 8. Yes I was disappointed, but I was also more motivated to keep working towards my goal. I decided to fly to LA last minute to try and walk on. With the help of some of my training partners, I made it to the walk on auditions just in time. I caught a last minute flight and waited in line with my fellow competitors. The casting director showed up the Friday before the tryouts and had us all fill out an application. He told us of the 40, 30 will be selected to walk on. I left, flew back to Phoenix and waited for the email. Low and behold, I received the email the very next day stating that I was selected as a walk on. Holy crap, I was on cloud nine!!!!!! I knew that everything I had been working for was on the horizon and it was time to rock. I packed up my truck and drove back out to LA the very next day because filming was to begin on Monday. YEEHAW BABY IT’S GO TIME!!!!! UNIVERSAL STUDIOS HERE I COME!!!!!! My folks happened to be in town visiting and decided to make the trip with me. It was like old times when they would follow me across the east coast for my field hockey games. You can only imagine the laughs we had 20 years later. I promised it was the last journey but we all knew that was obviously a bunch of Mullarkey:) We hit the road and made it safe and sound. Monday they wanted us on set for interviews and to get footage of us camping. It was so neat to be on set at Universal Studios with such amazing athletes, someone pinch me please! We spent the next several hours goofing around, waiting to be interviewed. I brought my hula hoop to keep me occupied and my cowboy hat to keep the sun out of my face. Low and behold, I was a lucky one and got an interview. All the time and energy working towards this goal and I was now being interviewed as a walk on for season 8. The thought of getting air time on NBC was exhilarating! The next day was the BIG DAY, LA regional tryouts. I was nervous as all get out, but was ready to get the show on the road. As a walk on, you have to show up at 5 pm and stay all night with the hopes of getting time to run the course. We were given a number and I was 26 out of 30. Not good if they run late and out of time, but I was going to stay positive that all my efforts would pay off. Luckily, I brought my Crazy Creek chair to sit and sleep on and my sleeping back from my backpacking days in good old Colorado because it got cold as heck that night. I felt really sorry for the folks that did not bring jackets, I actually loaned mine out to a fellow walk on poor guy was freezing. I stayed up until about midnight watching the competitors hit the course. I knew I would respond in one of two ways, I would either be scared or was ready to rumble. I was ready to rumble! I felt that the training and skills that I had learned the past year would allow me to give the course a run for it’s money. I also was ready to be a competitive female in a male dominated sport. I knew if I took it slow and steady that I could have a shot. At 5 am all snug as a bug in my sleeping bag I hear the casting director tell us……”Walk ons, warm up, you might have a shot at running”! I popped up out of my warm bag, with goose poops in my eyes and pillow creases on my face I started to warm up. I couldn’t believe that I might get a shot!!!! I remember looking around and there were still fans watching. It was almost sunrise and those die hard fans were still supporting their loved ones. As a walk on, we were not allowed to have friends or family there so it was up to us to cheer each other on. One by one, I watched my fellow walk ons get a shot at the course. Minute by minute I watched the sun start to rise. They only film at night and I knew as soon as the sun started to come up that I would not get a chance. Sure enough, they turned the lights out on the course and we ran out of time:( I couldn’t believe it, but I was not shocked. They had warned us that we might not get a chance to run. I WAS SOOOO CLOSE!!!!! Do I regret going? Nope! Do I wish I had a chance to run the course? Yes! Will I keep training for season 9? You bet your bottom! I began this journey to show my clients and followers on social media that you can do anything you put your mind too. I stepped out of my comfort zone and tried something new. Was it scary? Of course it was! I just turned 40 and was honored to be chosen as not only a walk on, but a female walk on. I am driven more now than ever to be chosen to tryout for season 9 and you can bet that I have not given up. This gal doesn’t back down without a fight:) The training continues and I am looking forward to next year! Keep training hard my friends, no matter what your goal is! If you are looking for a trainer who leads by example, I’m your gal:) Whether you are prepping for a bikini competition, to be the next American Ninja Warrior or to just get back into shape I can help you. Remember……”No Excuses and that’s No Mullarkey”!!!!!!! !